Some might say that taking big manufactures out of a series kills the interest and sounds its death knoll, but with the departure of the utterly dominant VW team from the Silk Way Rally, the event is still full of world-class drivers in stunning thoroughbred racing cars, and adds a strong element of unpredictability. 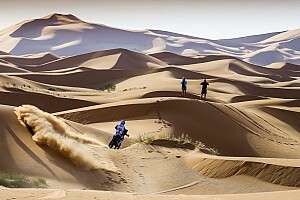 The rally proudly proclaims itself to be part of the Dakar series, and with 105 cars taking the start, the event took a step away from being a giant Volkswagen PR exercise to become an enthralling battle between old masters, ascending champions and young heroes through the heartlands of Russia. Rather it be about the weather or horses, it's human nature to make predictions, and before the ceremonial start in Red Square few would have bet against nine-time Dakar champion Stephane Peterhansel in his pea-green X-Raid Mini All4. If there was a form book though, it was thrown out of the window and trampled into the thick mud that the summer rains had turned the first stage into. Just a few kilometers in and his Mini developed fuel feed problems. Starved of power Peterhansel had to crawl through the 260km stage, dropping a massive 2 hours 24 minutes and instantly the event that he had such high hopes for became a 4000km test. At the top of the timesheets was the previously unknown Alexander Zheludov, the two-time Russian Rally Champion taking good advantage of the route cut through the tall grass by the 16 cars in front of him. Heroes die young though, and his glory was sadly short lived as mechanical woes cost 50 minutes on the very next stage... and suddenly Polish X-Raid BMW driver Krzysztof Holowczyc had a lead of nearly an hour over Christian Leville in his Nissan buggy. 6th place is obviously good, but our performance was really good enough for 4th. Whereas the story of the rally took place on the first stage for the car category, it was the opposite way around for the trucks. Don't think of these brightly coloured behemoths as anything like the things you see hauling goods on the motorway, imagine a 7 ton Group B rally car from the mid 80's capable of flying and taking outright stages wins and then you would have a better understanding of what these over-sized beasts really are. 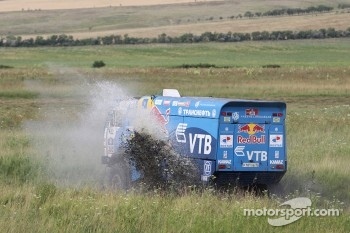 After the opening stage three Kamaz's were in the top three positions, although on the next test Eduard Nikolaev's engine failed, from where new team leader and 'mentor', two-time Dakar winner Firdaus Kabirov took over at the helm of the leaderboard. Despite the best efforts of Kamaz young gun Ayrat Mardeev and the gutsy Ales Loprais in the bright yellow TATRA (who almost knocked himself out after crashing over so many hard landings) he held a comfortable hour's lead. So far out in front was Kabirov that he had time to become the Good Samaritan of the rally and stopped to help fellow Russian Alexander Mironenko out of a tricky spot. The recovery cost 16 minutes, but a lead of 46' over Loprais should surely have been enough for the final 16km stage, but the next day he was caught speeding and had an hour's penalty added to his time. In a nasty twist it seems as though his generosity cost him the win, although in another twist, there was rumour that Loprais was also speeding in the same place, yet escaped penalization. Back at the front of the car class the winner was a little more clear cut. Holowczyc didn't just take his inherited lead for granted and set a couple of fastest stage times, although he was quick to complement his vastly more experienced team-mate. “You can always learn a thing or two when you are following an expert. I compare his pace to ours in different sections and see where I am being too cautious and where I am going too fast. He is the best reference there is right now, is he not?" But nothing with the word Dakar in the title can ever be taken for granted. Even Peterhansel commented on how tough the stages were. 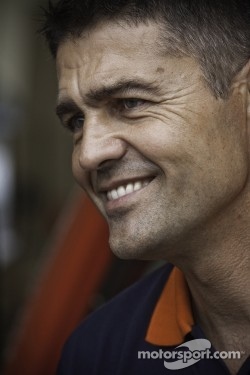 “[Some] sections are nasty because you get shaken around a lot, you are afraid of getting a bleed… In short, it was not very nice, and it was also long and physically tough… I am not sure we have had 5h 56' specials in the last Dakar!” To Holowczyc's credit with Peterhasel chasing him down for over 2000 competitive kilometres, the Pole only gave away some 20 minutes, a performance to be proud of and one that should put a marker against his name for future events. After 7 days of racing through the land of the Tzars, a memorable and extremely tough event (the penultimate stage was a staggering 689km long) the champagne bottles were sprayed with weary arms. Sochi is perhaps a fitting place for Holowczyc's Olympic performance to be celebrated, but rest doesn't come easy for those at the top of their game. In just a week the FIA World Cup for Cross-country Bajas resumes under the harsh Spanish sun with Leonid Novistky back behind the wheel of the lead X-Raid BMW hunting down his second championship. Motorsport.com will be there!